When there's no more room in your closet, Fright-Rags will continue to release killer apparel! 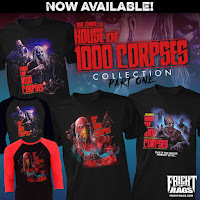 New merchandise from Dawn of the Dead, Hatchet, and House of 1000 Corpses is available now. 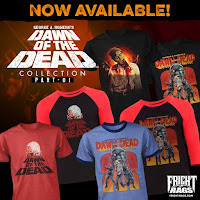 First up is a line of shirts from the George A. Romero classic, Dawn of the Dead. It features a comic book-style design by Nathan Thomas Milliner, a depiction of zombie Flyboy by Sam Coyne, and the film's classic logo. Enamel pins are also in stock. 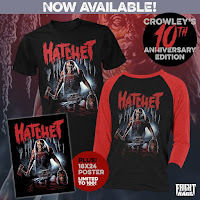 This year marks the 10th anniversary of Hatchet, Adam Green's throwback to the golden age of slasher flicks. Fright-Rags commemorates the occasion with gory artwork by Ralf Krause, available on shirts, baseball tees, hoodies, and 18x24 posters. 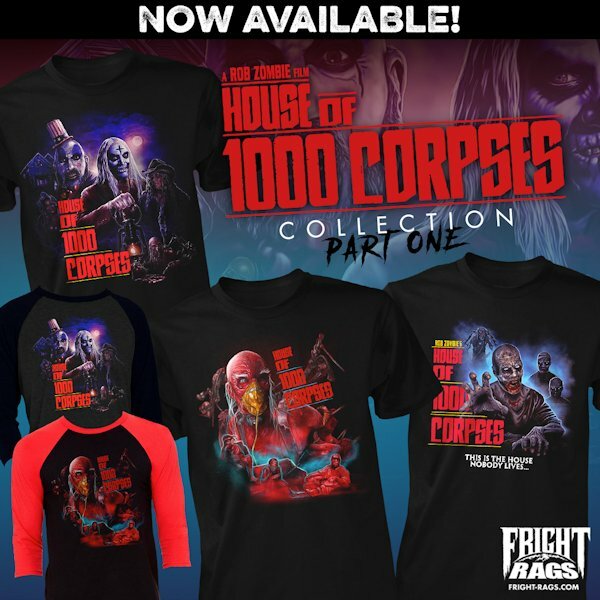 Fright-Rags dares to enter House of 1000 Corpses, Rob Zombie's directorial debut. Artists Ralf Krause, Scarecrowoven, and Marc Shoenbach offer colorful takes on Captain Spaulding, Otis, Dr. Satan, and the rest of the gang for new tees. Fans will also be happy to know that The Devil's Rejects merchandise is in the works. Dawn of the Dead, House of 1000 Corpses, and Hatchet collections are on sale now and can be purchased at Fright-Rags.com. Check back with Fright-Rags this Saturday, June 17, for a Midnight Madness Tee available exclusively for 24 hours. It's part man, part machine, all cop.